Once swarm cells are found in the colony, the bees have decided to swarm and started the process. The beekeeper has essentially two options: The beekeeper needs to make the bees think they have already swarmed or 2) they (meaning the beekeeper) need to stand on their head and mutter incantations to the bee Gods and hope that the fancy equipment they’ve bought to stop swarming works. You might be able to tell that I do not place great hope in the second strategy. The methods may and probably do work, but they require regular and frequent inspections & manipulations of the hive in order to work. The most common way to implement the first strategy is by splitting the hive, removing roughly 50% of the bees and the current queen. If you are seeing more than two swarm cells, it is safe to assume that the colony will issue a Prime Swarm with the current queen AND that it will issue After Swarms headed by a virgin queen. You may have heard that an emerging queen will kill her rivals. True enough, but when there are swarm cells younger than her by a day or more, those are usually ignored and not killed. The After Swarms can be stopped by cutting the queen cells – destroying them or transplanting them to be used somewhere else. If they are all on the same frame, cutting is usually the best option, leaving what the beekeeper thinks are the two oldest cells. The split that has been created could be recombined with the parent hive (usually using the newspaper method) before Maine’s late summer honey flow. Or it could be sold, or used to start a new hive. As I call them “the stand on your head methods” require that you use additional equipment. The Demaree method for example, has the beekeeper use a special board dividing the colony in two, with the box on top separated from the bottom by a Snelgrove Board. The current queen goes in the bottom box and all brood goes in the top box. All queen cells and cups are cut in the top box (but 1) every three days. On that same schedule, all new brood is removed to the top box. What has happened is that the old queen has plenty of room to lay, and that all of the young brood has been removed to the top box, where they are able to raise a queen. If everything works as it is supposed to, there is no swarming. There are lots of web references on the Demaree Method, many videos on You Tube, and even Snelgrove’s 1921 book. Oh yes, honey supers and little doors in the board are involved too. Check your web resources for details. In some variations, this is done as soon as queen cups are seen with Royal Jelly in them. There is lots of other equipment you could get. Then again, you could just let the bees swarm. This is the final A Curious Beekeeper Explores column. I hope you have enjoyed reading them. The column may return in the future on a different schedule. Thank you! Maine has a new Blueberry Specialist – that is uMaine Cooperative Extension has a new Blueberry Specialist. The uMaine school of Food and Agriculture gets a new associate professor of Horticulture too – and surprise – two part time positions make a full time one. Lily Calderwood replaces the soon to retire David Yarborough. Calderwood earned her Ph. D. at the University of Vermont in 2015. She comes to Maine from Cornell Cooperative Extension in Albany County. Why should beekeepers care about her appointment? Last year, a bit over 30,000 colonies of Honey bees came to Maine for commercial pollination. While there other crops that are pollinated commercially in Maine, I think it fair to say that most of those colonies came to pollinate wild blueberries. It wasn’t that many years ago that more than double that number of colonies came to Maine. That was when the price of blueberries wasn’t in the toilet. Think about it. Commercial Blueberry growers often use fungicides and insecticides which are in all probability not great for bees. Enter an entomologist. I have hopes. Bee Having as opposed to Bee Keeping is a concept that beekeepers have long been talking about although it is most recently credited to EAS Master Beekeeper George Imirie. I got into trouble on a Facebook Warre Hive forum a few weeks ago when I suggested that there was an obligation to treat bees as stock, and that should your bees die, you were further obligated to keep your hive from being robbed out, potentially spreading pests and diseases. The feeling on the Warre group was that no such obligation existed – both to keep an eye on your own hives, knowing what was happening inside them and to prevent dead colonies from being robbed out. The attitudes are (in my book anyway) an extreme application of the so called Bond Method (“Live and Let Die”) meaning that if the bees are not genetically strong enough to survive whatever maladies present themselves, it is best that they be removed from the gene pool. The Warre beekeepers follow the teachings of Emile Warre (1867-1951) in his book Beekeeping for All. There are some things about Warre’s hive that intrigue me, like the Quilt Box and the practice of harvesting honey after winter. But some of what is advocated on the Forum crosses the line as far as I am concerned – the not fixing of cross comb to keep frames removable for inspections, as one example. This practice is a violation of US law, one admittedly without enforcement, which requires bees to be kept in removable frame hives for disease inspection. One can get into great philosophical arguments about how one should respond to laws you disagree with most of which are not productive and change no-one’s mind. 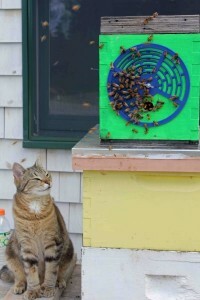 I will try a Warre hive next bee season, but I will do so as a keeper of bees. I’ve been at the honey producing game pretty much since the turn of the century and I’m learning that the old time experts are right – this is a lousy place to make honey. At least much of it. The Washington County Beekeepers had Matt Scott speak to the group about bee forage. He reminded us that many of the small primarily dairy farms that existed in Washington and Hancock Counties in the 1920s and 30s are gone – along with their clover and other bee pasture. So a bad location gets worse. But maybe it is time to order some of the random thoughts in my head and to do something to make the foraging better. Some of those agricultural chemicals are highly toxic to bees and my challenge then becomes how to keep my bees from flying the 2-3 miles that honey bees will fly to forage on potentially treated blueberry land. While honey production is currently my hobby I’d like to figure out a way to make some money at it. And having bees visit commercial blueberry fields at random times during the year for forage does not make for healthy bees. So my challenge is to create forage options on land I own that will in essence keep my bees home. Is it possible? I’m not entirely certain but I see my choice as giving up on keeping bees or trying – so try I will – but there is no way I will be able to compete with Supermarket honey prices. So what I am doing? I have planted several Linden Trees that should start flowering this coming year. There are over 30 Apple Trees (mostly wild, some planted by me) here. I have fields that I am attempting to keep open by mowing where I have scattered clover and vetch seed and I mostly wait until the Goldenrod is killed by frost before the annual mowing. My own patch of blueberries (somewhere between 5 and 10 acres) is un-managed except for mowing and as a result of the lack of management is home to an increasing number of wild roses and goldenrod (and native pollinators!). Harvesting is limited to what we pick ourselves. Also planted are Tulip and Peach trees and a vegetable garden with squash, pumpkins and some sunflowers. On the docket for this coming spring are plantings of common milkweed, Joe Pye weed and heather. I am considering a planting of an acre or so of buckwheat – if I can figure out how to do it – and what to use the resultant buckwheat for. As I plant all this “stuff” I need to be aware of what ag chemicals are used to treat bee maladies. I’ve given up treating prophylacticly for AFB – which so far I’ve gotten away with. I have some hives that get no treatments at all – while others get treated for Varroa mites using various “soft” chemicals. It is my hope to one day get away from all bee treatments. I release this musing to the Internet in hopes that I’ll get serious feedback. I do not like using any ag chemicals – and go so far as to not even use lime on my garden. There are times when especially the Apple trees could make use of fertilizer and sprays to combat diseases and pests – but I haven’t gone down that road (yet.) Then there are the woods (roughly 75% of my property) and electric fence lines where conventional practices often call for herbicides – again, I haven’t gone there, yet. Some days are just priceless. While I was clearing brush from around an electric fence in one yard Susan came to tell me that there “the bees were swarming.” We got back to the house and bees were moving in to a nuc box I placed only this morning as a swarm trap. There are 2 or 3 ancient combs in the five frame nuc box. The cat “No’Shy” short for “Not Shy” was unimpressed with the proceedings. The swarm came from another one of my yards. It was easy to see which hive thanks to all the activity. I’ll give them a day or two to settle into their new home and then move them back to the yard they swarmed from – they will get a new home to call their own! A wet Saturday afternoon. The first fire of the season in the woodstove. The perfect time to reflect on the past season and think about things that can still be done for the bees this season. I spent some time in my Russian yard at Beech Hill Farm yesterday. With the exception of one hive populations were very low – though I didn’t see an obvious disease signs. Queens were still present, some brood, and it was a healthy pearly white in appearance. No signs of Deformed Wing Virus or other nasties. As these bees are of Russian lineage and I have no intention of treating them for mites, I did not do any mite sampling. The colonies are light on stores too. I combined a few colonies and dispersed 8 gallons of 2:1 sugar syrup in 1 gallon paint cans. The cans were inverted on the top bars of the colonies being fed. Nail holes are punched in the lid for the bees to feed from. I used all the syrup I had with me and need to go back with more. All my cans are in use so I’ll have to wait for some to be emptied. I should have some by the end of next week and be ready for another visit to the yard. I wish I had paid more timely attention to this yard. The bees are located on a farm and there were plenty of nectar sources. No surplus honey was removed from this yard. Several years ago the state Apiarist visited this yard and detected virus (Sac brood) and Nosema issues. In aspiring to have this be a treatment free yard I have to understand that sometimes the bees are not going to survive what ails them. I still can want them to thrive and produce a nice (surplus) crop of honey next summer – but first I need to get the bees through next winter and spring. No one remotely promised that going treatment free would be free of pain. The Russian bees are supposed to be able to co-exist to a certain extent with the Varroa Mite but that doesn’t mean they shrug off other maladies too. So on this first day where it really feels like fall, this yard has me feeling blue. So I mowed and cleared grass from the bee yards and the electric fence. It looks much better and I found out the hard way that the fence is working! test update 2 – steady as she goes! Three weeks or so has passed since the treatment free hives were started and so far so good! All the queens were accepted and are laying. The first eggs should hatch in a day or so. It will be good to see the population of these hives increase. The grass surrounding the electric fence has been mowed once and is just about due for another cutting. With all the rain we’ve had recently the field grass is growing enthusiastically. The mowing is both to keep the fence clear so it continues to operate with a good charge and to have a path way for me to travel. A side benefit will hopefully be to reduce opportunities for deer ticks to attach themselves to me. So far this season I’ve found one, and that was crawling around on my clothing! A few of the hives are a bit behind the others. One had a very reduced population when introduced and another has a queen laying a high percentage of drones. I will not be unhappy if that queen gets superceded, but no signs of that so far. The division board feeder in each hive is being topped off twice a week. Two of the hives are emptying their feeder between visits while the others are not. As I’m using the black plastic type frame feeders that expand in width when filled the rest of the deep is taken up by the bees and 8 frames. All of the hives have drawn at least 4 frames and half of them have drawn 6. I’ll do a formal inspection of each hive later in the week and will post the status of each hive here. As for what is in bloom – the shad and the dandelions have gone by, the choke cherries are blooming now and the wild blackberries are almost ready to pop. The blueberry bloom is starting to wind down – there are three drops of commercial hives within three miles of my driveway, and another four drops between the driveway and Machias. It won’t be long now before the commercial hives get picked up and moved to another crop. I completed the hive registration form for the state this morning and was pleasantly surprised that I’m to report 38 hives this year. The registration fee of $12 is certainly a bargain, though I did have to search around for a checkbook so I could pay the fee. I had to hunt for the checkbook as I hadn’t written any checks on that account this year. Hurray for debit cards and electronic payments!